There's no single doubt. Dress shirts, in all their professional-might, look super cool, neat and handsome. And they are perfect for all season. Rock them un-tucked with ripped denim and slip-on OR pair them with classic trouser and leather shoes -- they promise men a dashing appearance on every occasion. Indeed, companies like Facebook have popularized a casual corporate ecosystem that's welcoming to all kinds of dressers. But that's not necessarily the case for all. Can you picture professionals at Morgan Stanley and Goldman Sachs dressed in tees and capris?! Likely now. The majority of offices today still demand employees to dress right. And this is where dress shirts come to play a savior for these employees. They are professional in feel and casual in comfort. Men love them! 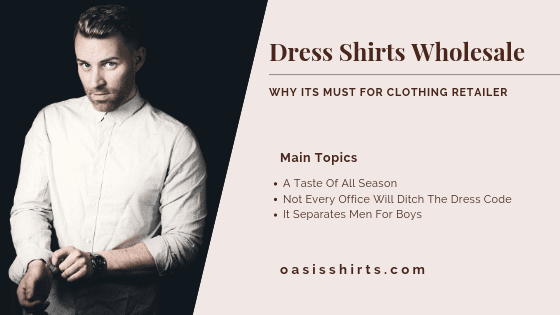 For all the men who want to stand out the crowd of hoodie-clad, snapback boys, the dress shirt is one of the most popular options. And it's evident why. You can easily tap on this niche of men by stacking personalized dress shirt wholesale. So, again, if you're a clothing business owner, look around at dress manufacturers USA based. Today, you won't have a hard time finding one of the top custom dress shirt manufacturers. Go through their collection and place your bulk order.